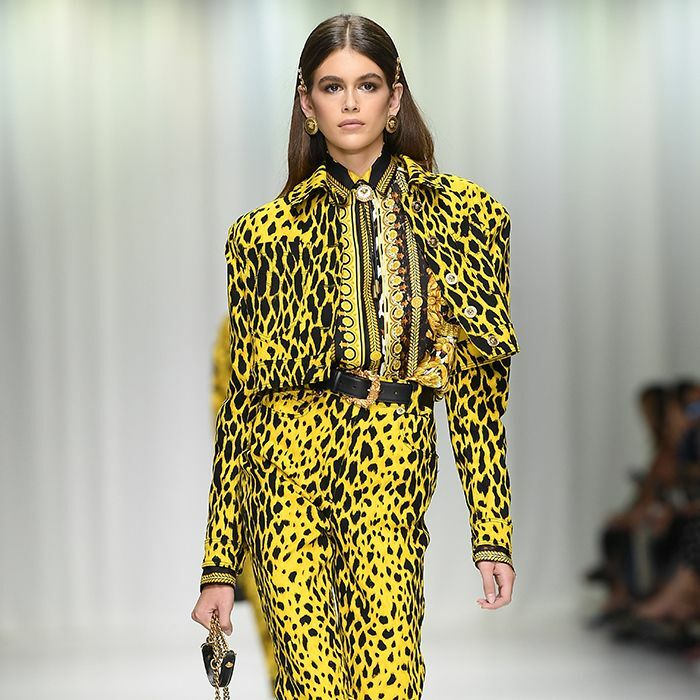 While Kaia Gerber landed her first modelling role at age 10 for Versace, it wasn't until 2017 that she made her catwalk debut. Since then, the 16-year-old appears to have already been catapulted to supermodel level. Her runway résumé now includes walking for Saint Laurent, Versace, Tom Ford, Alexander Wang and Chanel—essentially all the biggest names in fashion you can think of. And it's no wonder considering her mother is supermodel Cindy Crawford (Kaia is basically her doppelgänger). On the catwalk, she walks with confidence older than her years. As for her off-duty style, she opts for more dressed-down subtle looks (often created in tandem with NYC-based stylist Andrew Mukamal), proving she has mature tastes. Yes, we know it's her job to make clothes look good, but she's able to wear outfits that are youthful but still cool for any age, meaning her wardrobe is one we're often coveting. Click through the slideshow to see Kaia's best looks on and off the runway. Style Notes: No one could ever think that Kaia was anything other than her mother's daughter. And she's learnt well when it comes to dressing. This strapless gown is incredibly chic. Style Notes: Now this is how you nail off-duty model style. This ensemble consisting of leather trousers, black ankle boots, a crop top and a bomber jacket is just so effortlessly cool. Style Notes: At Rihanna's Fenty Puma show in September 2017, Gerber managed to make two fairly scary trends accessible: cycling shorts and Matrix shades. Style Notes: The Versace show last September was spectacular for many reasons—and not just because it featured a finale with the original supermodels. Kaia also stood out wearing this Vogue jumpsuit. Style Notes: It was arguably during this Saint Laurent show that everyone really took notice of Kaia's skills as a runway model. This show was set under the Eiffel Tower and was one incredible moment. Style Notes: DMs, plaid shorts, a crop top and an oversize blazer? Yes, we're into this. Style Notes: Kaia got the memo that white shoes elevate any outfit. Style Notes: At the Fashion Awards in 2017, Kaia went for a baby blue Ralph & Russo dress with pearl embellishments. Style Notes: More confirmation that the model is making waves in the world of fashion: Gerber walked for the Chanel couture show this January. Style Notes: Another great off-duty look with DMs, high-waisted cropped jeans, a leather jacket and a Supreme hat. Style Notes: Thanks to Kaia's excellent headband-wearing skills, we're now considering investing in this microtrend. Style Notes: Matching printed denim, a crop top and a beanie with sunnies? This is a look worthy of a Hadid. Style Notes: A boilersuit never looked cooler. Style Notes: There's nothing cooler than wearing a pair of dress trousers with a white Versace tee. Just make sure your hair is perfectly blow-dried and the sunglasses are in place. Style Notes: The boiler suit makes a return—but this time Kaia's opted for classic streetwear accessories. The Nike trainers, bum bag and Supreme beanie take this look to the next level.